Symptoms: Neither ball diverter was working, drop targets on mini-playfield were sticking. The ball diverters at on the left and right ramps were simply loose on their shafts. I tightened up the set screws on the left diverter. The right diverter was binding a little after tightening the set screws and I determined the arm was slightly bent. I straightened it and it worked fine. I removed and cleaned the drop targets from the mini-playfield. They had been lubricated with white lithium grease, and as usual, it had dried and was causing them to stick. I looked at the Test Report and it reported that the switch on the main playfield drop target was not working. It was simply a case of the drop target sticking and never engaging the switch. I removed and cleaned the drop target. There were a couple of broken wires that I re-soldered to their correct locations; one was a flasher and the other a GI bulb. I replaced 24 bad bulbs. 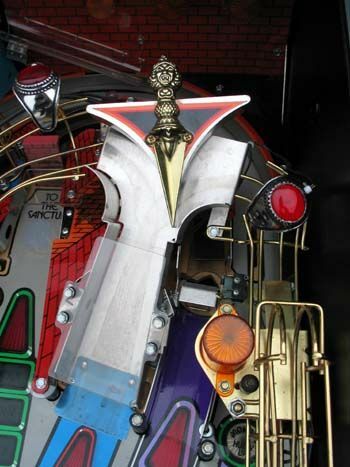 There are four rings with lighted jewels incorporated into the playfield (see photo above). They are illuminated with a grain of rice lamp that is hard-wired. Three of those lights on this machine are out. Marco has these and will order. I’m guessing they are glued in place. The machine also needs a new set of pinballs. Any pinballs that don’t look shiny and new should be replaced on any machine in order to keep the playfield in good condition. All in all, just routine maintenance. Symptoms: Flipper was stuck, multiple connection problems, neither slingshot working. Stuck flipper: The flipper was stuck because the end of stroke (EOS) switch was broken exactly at the flipper’s maximum travel point. The flipper wouldn’t return because it was getting hung up on the broken contact. For a quick fix, I put a piece of shrink tubing over the end of the contact to lengthen it. As the tubing cooled, I flattened it with my fingers, which basically made a plastic extension for the contact. Eventually the switch will need to be replaced, but for now it is working fine. Connection problems: There were some connection problems causing balls to be continuously delivered to the shooting lane. Taking a look at the switch test diagnostics, I determined a whole “row” of switches was shorted to ground (row 4). After checking every switch location in the row on the cabinet and under the playfield, and not seeing any obvious shorts, I decided to look at the back box. There I discovered if I pressed on the lower corner CPU, the short would go away. My initial assumption was that it was something on the CPU board shorting out. Yet, when I unplugged J212 the problem would disappear. Row 4 is the end pin on the connector (pin 8). 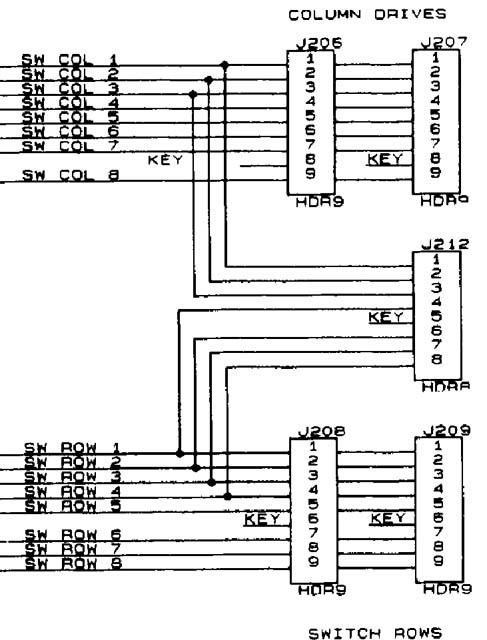 So why does lightly pressing on the CPU board cause something associated with J212 to short/unshort. I looked all around and traced the wires back and couldn’t see anything. Unfortunately, I moved something and the short went away and never came back while I was at the customer’s site. After I left the short returned. On a subsequent visit, the problem had gone away again and couldn’t be found. Slingshots: The owner didn’t realize that neither slingshot was working. Both had broken mechanical links from the plungers, one had a broken arm. Replacement parts were ordered and installed. Doing one last check of the Test Report, I saw that the EOS switch on the left upper flipper was disconnected. I found the broken wire and resoldered it to the switch. The Test Report also revealed that one of the ball trough opto switches wasn’t working. Using a cell phone camera, which can see the infrared light of the opto switches, I determined that one of the IR LED’s was not illuminated. I checked continuity and didn’t find any problems with the circuit board. The LED was burned out. After a discussion with the owner who assured me that the game is working fine, we decided to leave it as is. There are 7 opto switches monitoring the ball trough and it was of the ones in the middle. My guess is since the CPU knows it’s bad, it can work around it. If it causes a problem, there is a very nice after-market IR LED board available which has several design improvements. And finally, the entire game had intermittent power. I quickly determined that the line cord was not plugged securely into the rear of the game. Other than just a few test games, I’ve never played Judge Dredd. It seems like an interesting and challenging game. This post has a follow-up here.